I have always had at least a few houseplants in my home ever since I was a teenager. 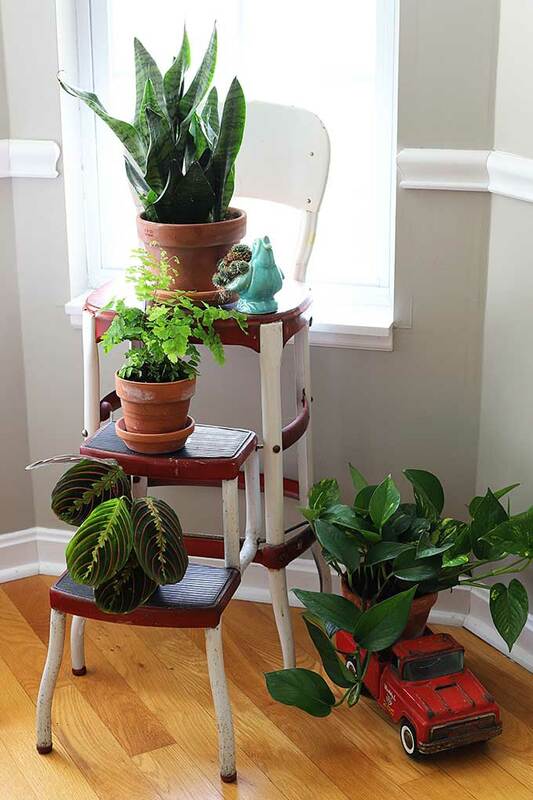 Growing up in the 70’s houseplants were a HUGE part of decorating. So were macrame plant hangers, shag carpeting and avocado green appliances. Some things go out of style fairly quickly (thank you, avocado green appliances) and some just step out of the limelight for a while, never quite going away completely. I would put houseplants in that category. But oh baby, they’re back! Houseplants are HOT again! Let’s just hope shag carpeting does not follow their lead. 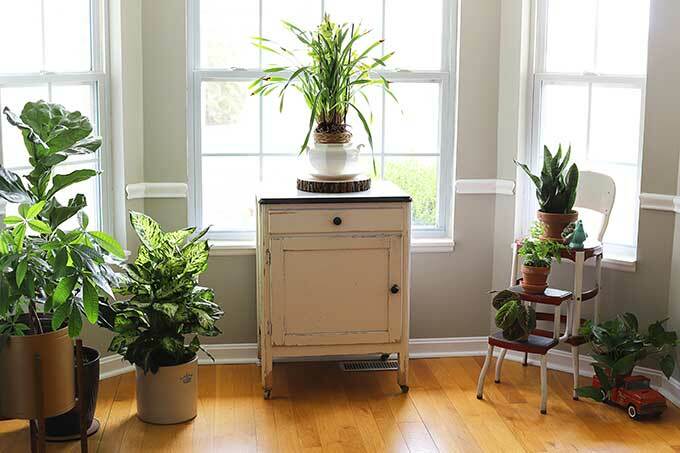 So whether this is your very first time growing houseplants, or you’re just getting back in the houseplant game after a few years away, here is a list of 9 easy to care for houseplants to get you going. Snake plants are so darn easy to grow it’s ridiculous. Snake plants thrive on neglect. Yep, if you forget to water them for a few weeks or better yet, if you forget you actually bought a snake plant a few months ago, no problem. They can handle it. Actually about the only way you can kill one of these is by over-watering. And you’ll know you’re over-watering it if the leaves start falling over and getting mushy. Just let the soil dry between watering and just seriously throw a cup of water on it every 2-3 weeks and you will be good. Snake plants prefer indirect light, but can grow just about anywhere from full sun to low light. Yeah, they’re that happy go lucky. The large glossy leaves with lots of holes and splits are what make this plant the darling of home decor experts. At the craft stores they actually sell faux versions of the huge leaves you can just plop in vases for instant home decor. They’re that popular! 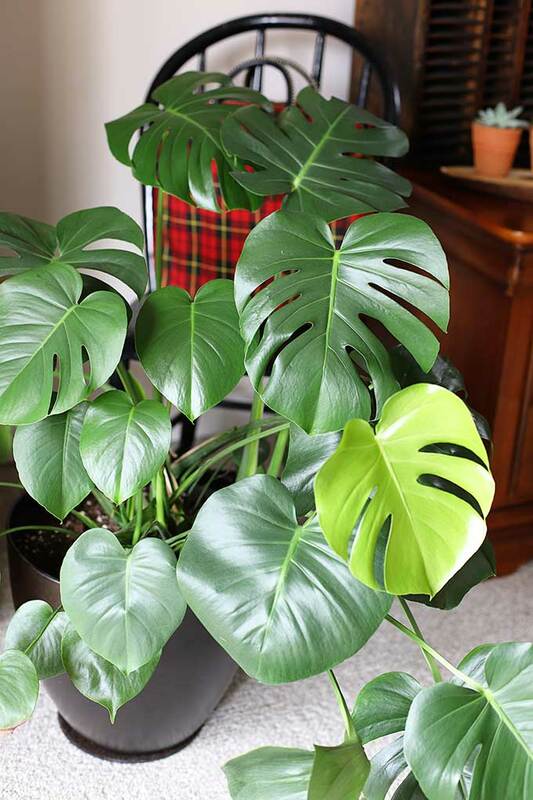 Assuming you are going to plant real ones though, Monstera plants prefer filtered indirect light. Too much light and the leaves will burn. Too little light and the leaves won’t develop as many lovely splits and holes and believe me, you don’t want to cut down on the splits and holes. Water when the top 1/3 of the soil feels dry to the touch. I think every budding houseplant enthusiast should have a pothos in their collection. They just grow and grow and grow without a ton of fuss needed and will give you the confidence needed to try other houseplants. Mine is driving around in a toy truck, but they look equally well in a hanging basket. Maybe a macrame one? Did I mention that is back again too? Pothos can tolerate low light, but may not grow as fast and furious as if it were in its preferred bright, indirect light. And variegated varieties will slowly turn more green and less variegated in the low light conditions. But these plants have been a staple in offices building and hotels for years, so they are pretty much tolerant of all lighting conditions. Water your pothos when dry. 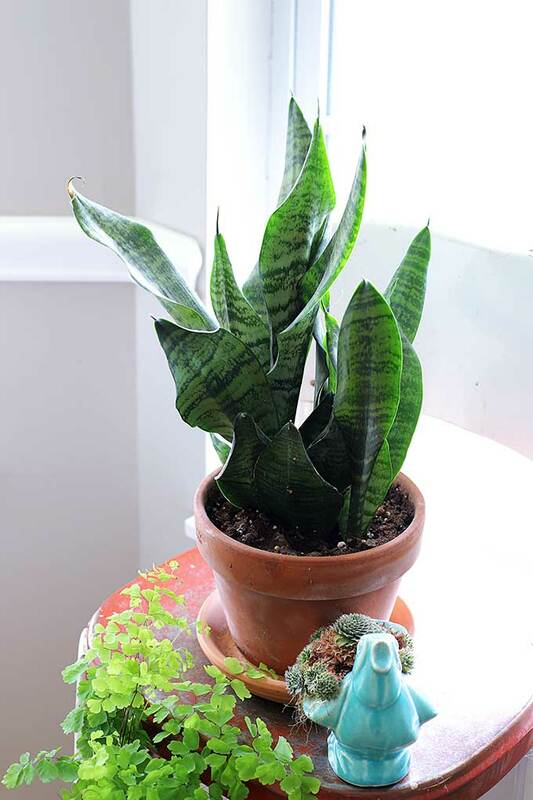 Like the snake plant, they can tolerate quite a bit of watering neglect and about the only way to kill them is to over-water them. I generally let mine go completely dry, then water until it runs out the bottom of the plant and neglect it for another 7-10 days until it dries out again. 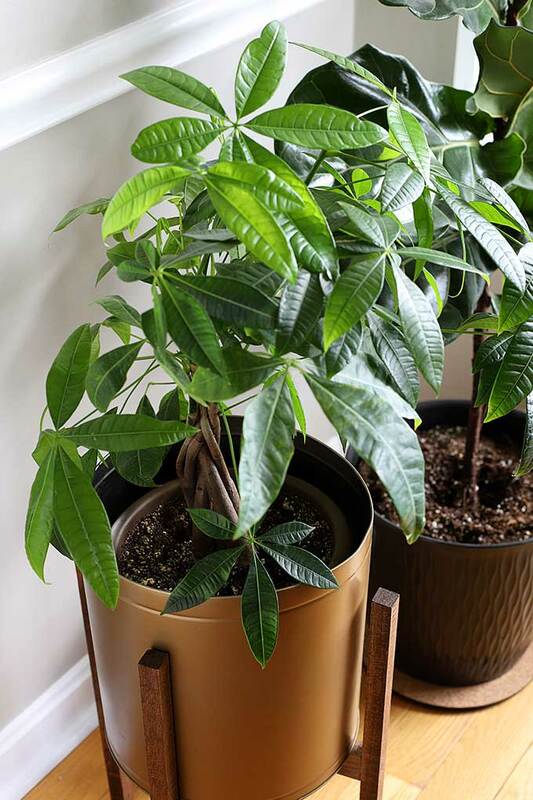 It’s hard to resist a money tree plant with their fancy braided trunks and lovely foliage. Plus a lot of people think the plants bring financial success and good luck, so there’s that! They prefer bright, indirect light and prefer to dry out a bit between waterings. Water when the top 2-4 inches of soil are dry. Water thoroughly until the water runs out the bottom of the plant and then don’t water again until it dries out again. If it starts dropping leaves you may be over-watering it. These guys prefers humidity, so if you don’t have it in a super humid area of the house (bathroom, kitchen, fancy sauna room), it is recommended to place the money tree’s pot on top of a pebble filled tray of water to increase humidity (the pebble keep the pot from setting directly in the water). 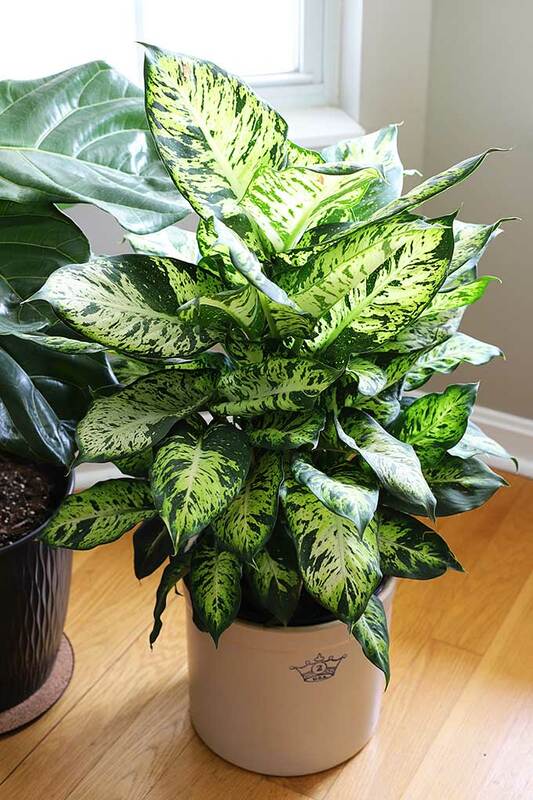 Dieffenbachia is a large, showy plant with bright green leaves with white or cream centers. Some varieties can grow as tall as 5 foot, so make sure you have room in your home for this one! This plant prefers bright, indirect light but can grow in a wide range of lighting conditions. Dieffenbachia like consistently moist, yet not soggy soil, so water when the top inch of soil feels dry. I think the little babies are what make a spider plant special. These look great in hanging baskets or just setting on the counter. Spider plants like bright to moderate indirect sunlight and moderately moist soil. When watering soak the soil completely and then allow to dry out between waterings. And like a lot of these plants, over-watering on a consistent basis is about the only bad thing you can do. 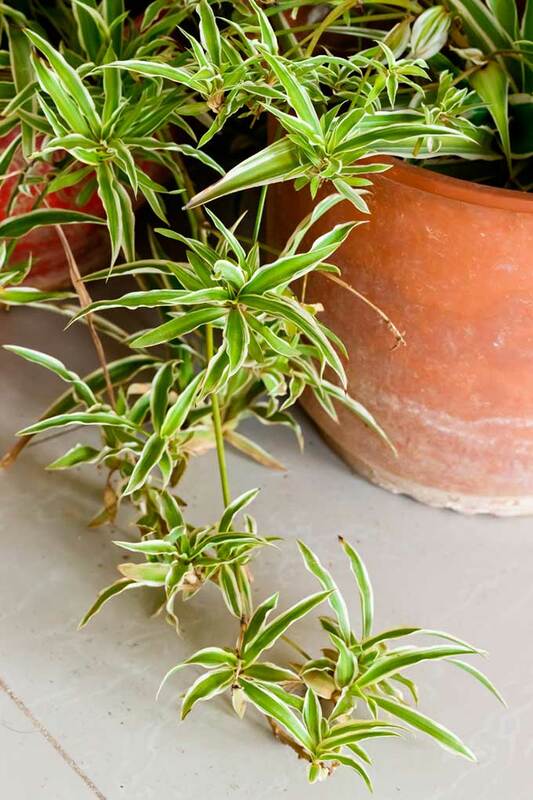 Once your spider plant’s babies get substantial roots on them you can pluck them off and re-pot them to grow another plant. It’s the plant that keeps on giving! Pretty much like all moms out there! Oh, the fiddle leaf fig! They are the trendy cousin of the ficus trees of the 80’s and pretty much a staple in home decor nowadays. 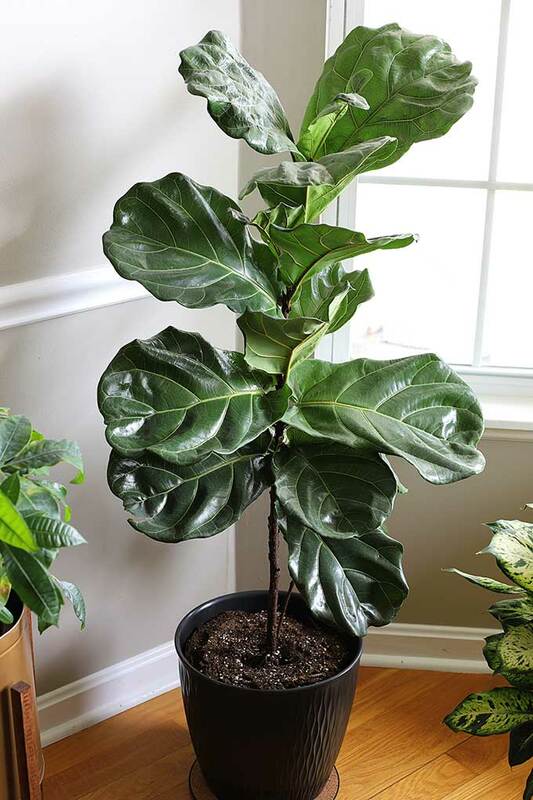 Here is my BIG TIP for growing fiddle leaf figs – don’t move them around a lot. When you bring them home from the store, pick out a place with bright indirect light, away from a heating vent or exterior door and keep it there. Fiddle leaf figs do not do well with change. And for the first month or so after buying one, they may seem a little upset in their new home and may drop a few leaves (remember, they do not like change), but they will adjust. Watering? That’s simple. Water them the same amount of water each week and just once a week. I water mine on Saturdays. For small plants up to 2 foot tall, one cup of water is good. For mid-size plants two cups of water and for large plants three cups of water. Beautiful leaves and beautiful blooms, what’s not to love about this houseplant! Although they do remind me of funerals, because it’s a common houseplant florists will send to services, but just forget I mentioned that. 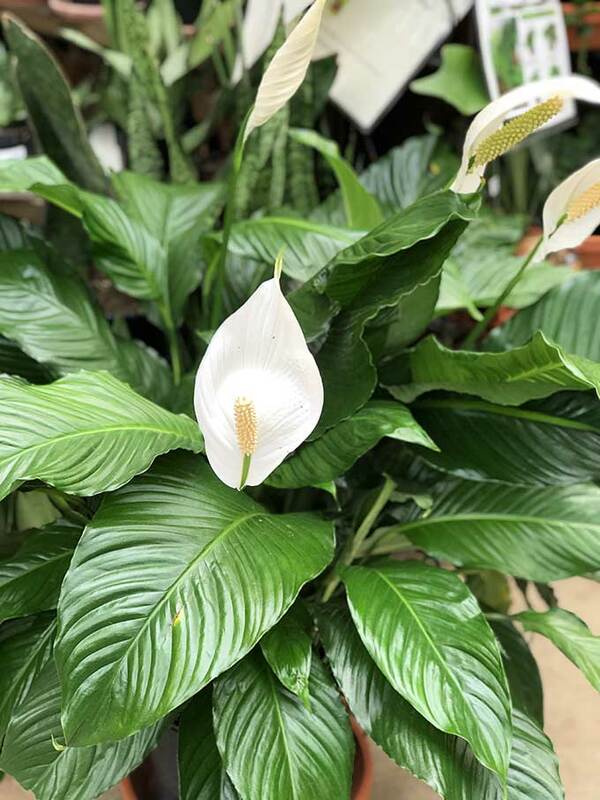 Peace Lilies are super easy to care for. They prefer bright indirect light and can do well in lower light situations, although they may not bloom as well in the low light. They love evenly moist soil, so don’t allow to dry out completely. A of too dry soil is browning on the tips. If they wilt it’s a sign of too little water. Besides the whole praying thing (the leaves close up in the evening and reopen in the morning), the thing I love about prayer plants are the lovely variegated leaves. The plant I’m showing you in the photo is very young and was just started as a cutting from a friend so it’s a bit small, but even at this early stage it is a gorgeous plant! It does best in bright indirect light. They should be kept moist, yet not soggy and they do not like to dry out. 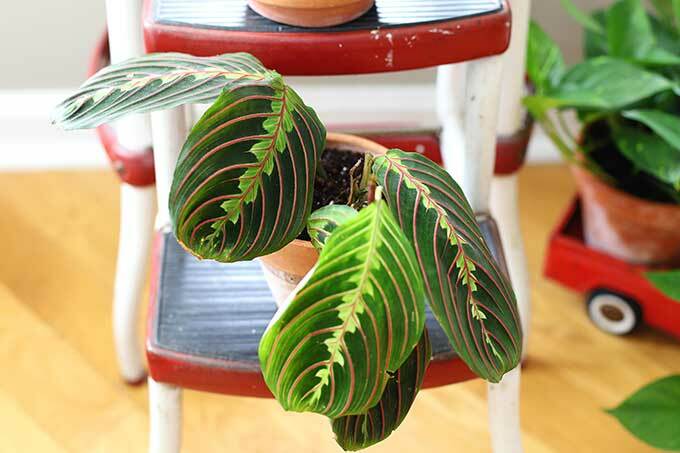 Like the money tree plant, the prayer plant can benefit from some extra humidity, so you can place the pot on top of a pebble filled tray of water (the pebble keep the pot from setting directly in the water) to give it a humidity boost. One slight downside to this plant is they are prone to some pests (spider mites and mealybugs) so be mindful of that. Just give it a once over at the nursery before you buy it to make sure it is pest free. You’ll notice tiny spider webbing between the leaves as the first sign of spider mites and a white powdery substance on the leaves as a sign of a mealybug problem. If either of those exist, just slowly back away from the plant, wash your hands thoroughly and put on your hazmat suit. Just kidding, just buy your plant at another store! I’m going to make a sweeping statement here about the toxicity of houseplants that may be going overboard, but I tend to err on the side of caution. A LOT of houseplants can be toxic to pets and humans, so keep plants away from toddlers and animals who are prone to eating leaves and flowers. And if a toddler or animal ingests a plant, any plant, I would contact poison control just to be on the safe side. I’ve been there. You’re at the local nursery and you come across a plant you immediately NEED to add to your growing obsession/collection of houseplants. But the tag says low light. Hmm, what exactly does that mean? There are three general light requirements you’ll see on the tags. Low light does not mean NO light. It doesn’t mean to stick it in a drawer, it just means it can handle maybe being tucked in a bookcase or put in the middle of the room where it gets room light, but does not have sunlight beating down on it during the day. I have the vast majority of my plants in the back windows of my house which are technically east facing. There are no trees outside the windows, so they do get a fair amount of sun, but it’s all in the morning. If I have a plant that need low light levels, I will move the plant more to the middle of the room and put it on my coffee table or on top of the refrigerator. If I have a plant with high light requirements, I will keep it close to the windows. Buy plants. Lots and lots of plants. Choose ones that are easy to care for. Don’t get too hung up on light requirements. Keep your houseplants away from curious toddlers and chewing pets. What is your favorite plant to grow? Do you consider yourself a crazy plant lady? I got a money tree plant at Trader Joes a few years ago and it is still going strong. I would have ten plants in every room if I could find the space. Start hanging them from the ceiling and you can have a jungle going on in your house! informative. i like the prayer plAnt. only one i haven’t killed. I love the colors of the prayer plants! They sort of break up all the green! i can not have any plants in my home,i have a cat who eats them down to the soil.at one time [in the big house]i had around 60 plants it would take more than a hour to water them this was pre muffy. Great post, Pam… and perfect for those of us in small homes that have not gardening area outside. I had a money tree, and it did very well in my humid apartment (by the beach). But, I brought it to the office and it didn’t like it so much. Several reasons, I’m thinking. Pinned! Thank you for sharing this. My home is usually where plants come to die, lol. I’ll definitely have to try some of these. I am looking to add some greenery in my new home and these are great tips. Thank you for the inspiration. My husband has been asking me to put some plants in the house. Now. I have a guide for what to buy. Love it. I remember the spider plants so well. If we knocked a piece off of it, my mom would just stick it in water until it sprouted roots and she could start another spider plant. She was really big on plants. Inside and out. She and my grandma were very big on African Violets. I had one for awhile when the kids were little, but it didn’t flower because I wasn’t worthy, I guess. Oh, but I can picture the macrame hanging plant holders. They were EVERYWHERE in our house in the 70’s! Thank you for this information. I have systematically and sadly killed a number of plants and there are so many tips in this article I did not follow telling me why I killed these poor souls. I have given up on buying new plants but I am rather confident after reading your blog. Thank you and fingers crossed. I’m a fellow houseplant lover too! 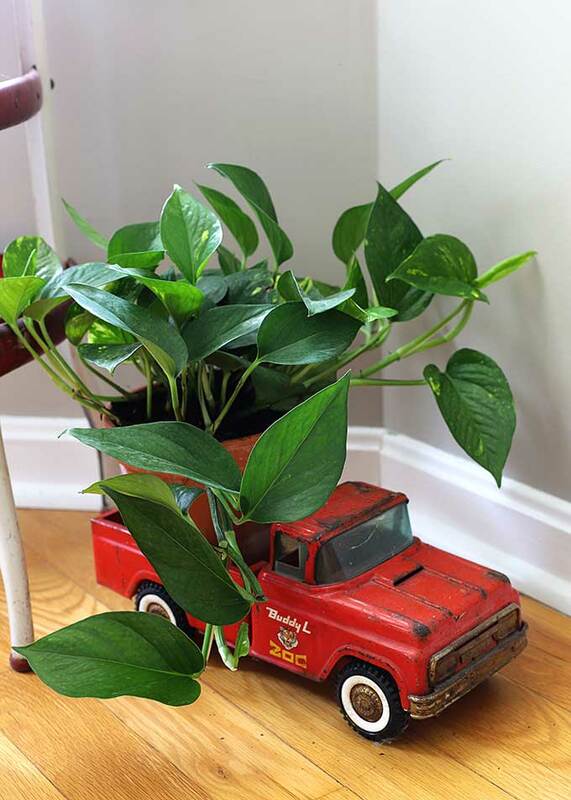 I love how you used the red truck to display a plant! Thanks for this post Pam. I can definitely use all the help I can get since I have such a brown thumb.